3Gstore is excited to announce the availability of the first six amplifier kits from weBoost, the new line of signal boosters from Wilson Electronics. The weBoost lineup includes products for a variety of applications, from vehicle boosters to kits for the home to powerful options for large homes and offices. In addition to sleek design, all of weBoost's amplifiers comply with the latest FCC regulations and feature innovative technology that allows the amplifiers to automatically adjust their power to avoid interference with the tower (unlike products that rely on physical knobs that must be manually adjusted by the user). The weBoost Drive 4G-S (470107), pictured at right, is a cradle amplifier similiar to the uber-popular Wilson Sleek. 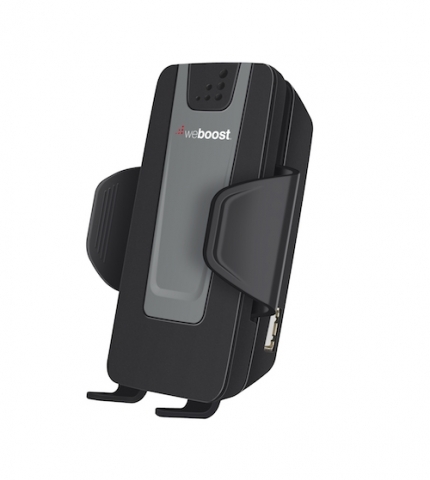 It supports a single phone or hotspot and is super portable! For vehicle use, the 50db Drive 3G-M (470102) and 5-band Drive 4G-M (470108) can support multiple users in a small area. weBoost's Home 3G (473105) and Home 4G (470101) amplifiers are ideal for small homes and apartments. The Connect 5-band 3G/4G kit with yagi antenna (470103) 65db amplifier is suitable for small home/office areas. Additional weBoost models will be available later in the year.